Last Friday I stopped by Swan Lake and noticed 3 American Coots feeding along the Lake Street shore about mid-way between the peninsula and the radio station. A short while later they started heading up the lake, though the one seen in this picture straggled behind a bit, allowing me time to get to a place where I could get a picture that was at least recognizable. 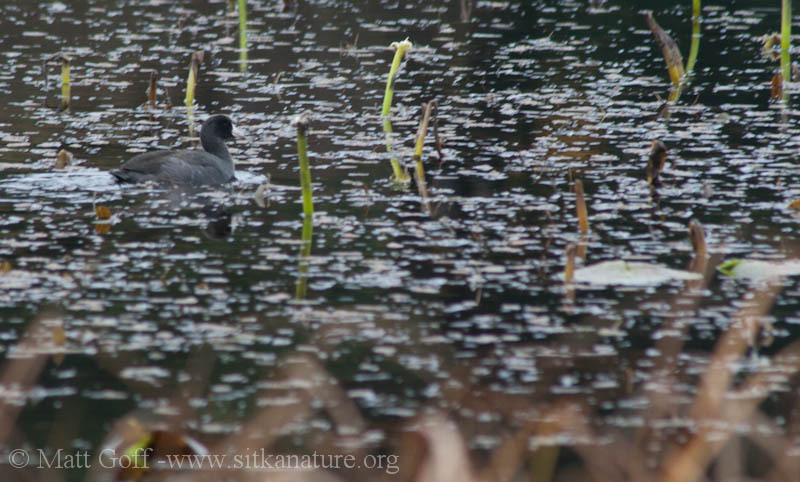 American Coots are considered Rare in the state of Alaska, though at least one (and as many as 7) have shown up annually in the fall on Swan Lake for several years – and possibly every year since the late 1980s. Usually they are first reported in October, and will stay at least until the lake freezes and in mild winters will remain until spring. It’s not unusual to see them around after the lake has frozen, though if it remains frozen for an extended period, they will disappear. At least some are killed – I saw a road-killed bird last year – and others probably succumb to the cold, but I suspect most fly elsewhere in search of better conditions. As an example, a couple of years ago one was seen several times at Crescent Harbor after Swan Lake had frozen. In the Sitka area coots have also been observed at Medvejie Hatchery, and Salmon Lake. It’s not clear whether the same bird will return for more than one year. However, after one spent the winter at Bear Cove (Medvejie Hatchery) around the netpens (probably eating some of the food fed to the salmon), the following fall one showed up again and seemed to follow some of the same patterns as the previous winter’s bird. This might suggest it was the same individual. For some reason during the second winter the bird did not stay through until the spring. This entry was posted in birds, photo and tagged American Coot, Swan Lake. Bookmark the permalink.